Integrated Power Outlets and more! Convenient power hook-up at your finger tips! 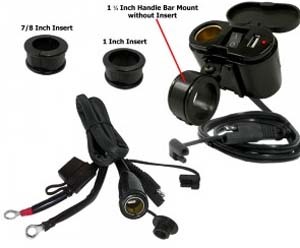 AEK-110,110B: Charging System with Solid Steel Adjustable Handle Bar Mount and Mount Insert Rings is our Ultimate Motorcycle Cellphone & GPS Charging System on the market today with a 3 Ft 6 Inch length wire, one 12 Volt Power Socket, an On / Off Switch, LED indicator light and a Database-ready USB Port that will charge all mobile devices and equipment, even with computer based operating systems such as iPhones, Android Phones, Windows Phones, iPods, iPads, Zunes, MP3 Players e-Books, and so much more! 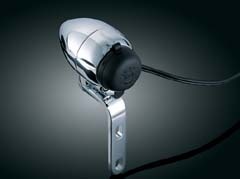 The handle bar mount also has a locking plate mechanism, leaving you with the secure feeling, knowing thieves can’t steal your unit off your bike. 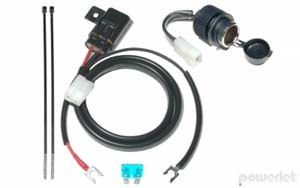 This package also includes a 2000 Amp EZ Jump-Start 2 Ft battery harness, complete with 12 gauge female BMW Jumper Plug (Capable of Handling over 2000 cranking amps! 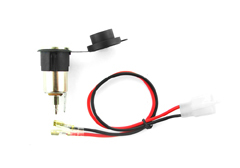 ), a 15 amp fuse ;ink, waterproof caps, an SAE dual pin quick connector that works on all conventional battery chargers, and an adjustable steel mount and mount insert rings that fits ALL 7/8 inch, 1 inch & 1 ¼ inch handle bars! Note: The jump-start 2 ft battery jarness in this package is also compatible with our Bike-2-Bike plug-in universal battery jumping Kit. 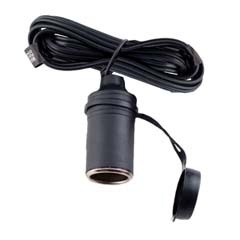 AEK-108: Cell phone and GPS adapter allowing you to conveniently charge your phone, GPS, heated clothing, etc... 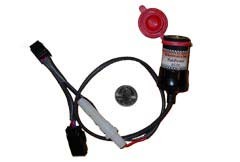 This kit is a waterproof 4' wiring harness with a 15 Amp fuse, a SAE dual pin quick connector (which works with many popular battery chargers), and a power socket that is compatible with most all 12 volt powered equipment such as radar detectors, heated clothing, GPS and much more! KK-76: Connect an iPod® directly to your factory or aftermarket radio & provides video output from compatible iPods (including the iPod Classic, Touch & Nano). Supplies power & charges your iPod. 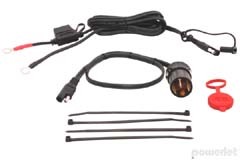 Includes: CORE for iPod, 3.5mm to a/v RCA cable, 3.5mm to 3.5mm cable, cigarette lighter charger, 3 wire power cable for optional hardwire installation. 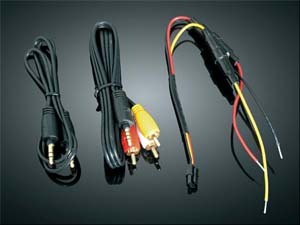 Allows for connection to any factory or aftermarket source unit with RCA or 1/8” (3.5mm) audio inputs using the supplied cables. 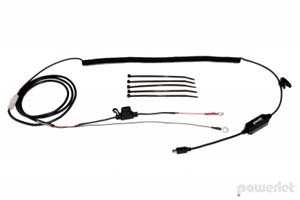 PKT-026-C/B: The PKT-026-C and PKT-026-B and accessories by Powerlet primary uses are: battery charging, heated vests, portable music systems, bike-to-bike communicators. 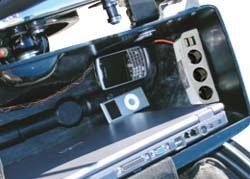 Secondary uses: cell phones, radar detectors, GPS units. Multipurpose cigarette lighter adapter available. SAE Adapter fits battery chargers and many electric vest sockets. Widder and Gerbings Electric Vest Adapters available. Call for special adapter needs. For all 1991 and newer models with the horn bracket below the gas tank. 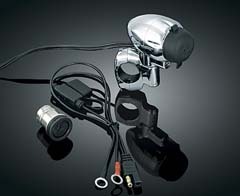 High quality show chrome PKT-026-C or black PKT-026-B bracket with vibration proof Powerlet socket. Benefits: Compatible with many accessories. No need to drill or modify any stock components. Very easy installation...20 minutes. 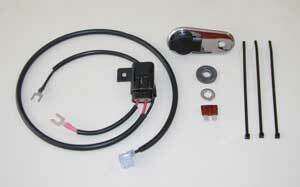 The kits is specifically designed and tested to fit the Electra Glide or Road King. The wiring harness is cut to length to fit. AKT-001-24: Weather-proof tether lid. 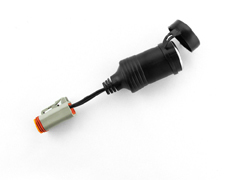 T connector makes wiring easy. This high quality socket requires a 1.125" hole. Top flange is 1.510" diameter & requires 1.75" behind the panel. Comes with a matching plastic jam nut for mounting. 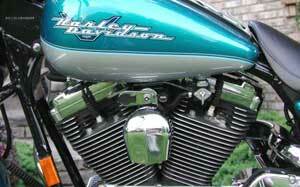 We understand that many riders prefer the common cigarette type socket found in their automobile. So Powerlet has designed these kits using the tightest fitting cigarette sockets available. 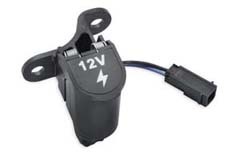 However, even with a tight fitting cigarette socket typical vibration found on the panel of many powersport vehicles can cause an automotive cigarette type socket to loose power. 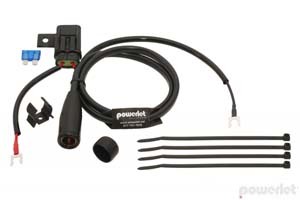 PKT-003-24: The simplest way to install a Powerlet socket in your tour-pak, this kit uses only ty-wraps, no need for drilling or wrenching. As will all Powerlet socket kits, these power outlets can do everything. Power-in for battery charging, no problem. 15 amps out for heated gear, no problem. 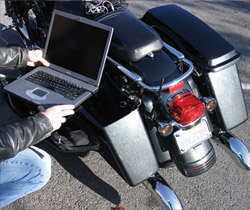 Nice for mounting up front in hidden locations for GPS or radar detectors. PPC-034: Works with Apple 3G-4S iPhones and all previous models of iPod including some Nanos. 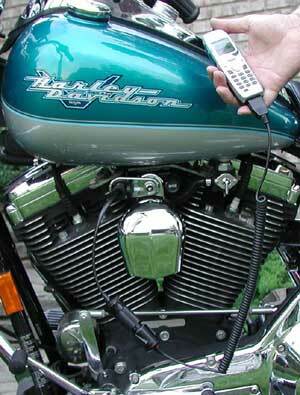 Cable mounted in-line regulator assures the voltage is properly stepped down to operate the iPod. 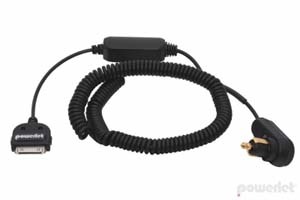 Features a 36" coil cable and Right Angle Plug. Note: Not compatible with the iPhone 3G (see PPC-026). PPC-034-SC: Works with Apple 3G-4S iPhones and all previous models of iPod including some Nanos. Cable mounted in-line regulator assures the voltage is properly stepped down to operate the iPod. Features a 12" cable and Straight Angle Plug. Note: Not compatible with the iPhone 3G (see PPC-026). 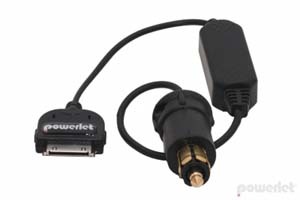 PPC-026: Works with Apple iPhone 3G, 3GS, and iPod Touch. Cable mounted in-line regulator assures the voltage is properly stepped down to operate the iPod. 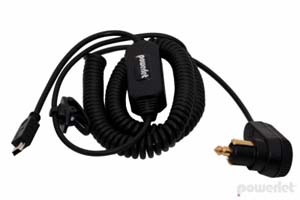 Features a 36" coil cable and PPL-004 Right Angle Plug. PPC-026-SC: Works with Apple iPhone 3G, 3GS, 4G (no compatible with 4S) and iPod Touch. Cable mounted in-line regulator assures the voltage is properly stepped down to operate a player. 12" in length with a PPL-002 straight plug. PO-826: Charge your cell phone or portable music player from this handy Tour-Pak® mounted 12-volt power port. 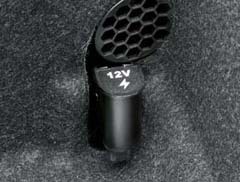 Conventional "cigarette lighter" style power outlet accepts most 12V automotive-style power adaptor plugs, and features a flip-top cover to protect the port while not in use. Fits '14-later FLHTCU, FLHTCUL, FLTRU and FLHTCUTG models. 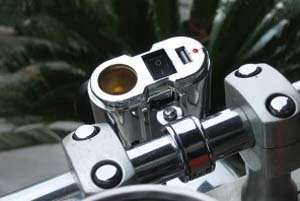 Easy plug-in installation, the port is held firmly in place with a bolt-on bracket. 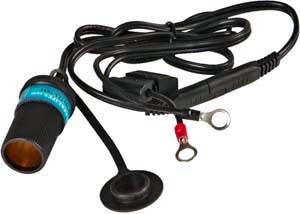 PO-224: Quickly install a Cigarette socket on any area of the bike, including the tour-pak. This kit does not require drilling or mounting a bracket. The SAE led is secured quickly with ty wraps and can be hidden from sight. 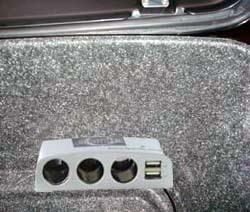 The SAE to Cigarette adapter can be stored in your tour-pak. Fused at 10 Amps. 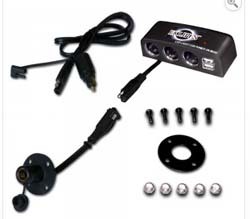 PO-220: The PO-220 is a handly OEM connectorized plug-in auxiliary power socket for inside your Tour-pak. Power or charge personal electronics ranging from cell phones to laptops in the standard cigar-type receiptable. Unit comes with safety cap and in-line fuse. PO-G: Quickly install a Cigarette socket in your tour-pak or any location. Manually add connector, solder or wire pigtail to available power and ground. Economical solution. 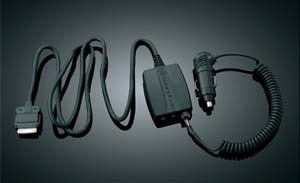 PP Outlets: Perfect for plugging in your cell phone, iPod, air pump, or any other electrical devices taken on the road. This power point/cigarette lighter will keep them charged. Built into our silver bullet light housing, this comes with everything you need to connect directly to your battery with a quick disconnect. PP-23: Fits stock 1" handlebars. 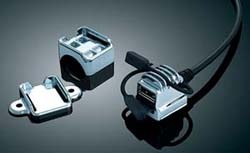 PP-83: Fits: H-D: All '82 - current H-D model clutch or brake perch mounts. DS-MP: Multiport Charging Station is the Ultimate Power Sports Charging Station with 3 12Volt Power Sockets, 2 USB Ports and SAE Plug. It also comes with a flange mount with a female Plug on one side and an SAE Plug. There's a 2-foot 10-inch power line with an SAE Plug which plugs in perfectly to any battery harness and a Male Plug on the other end that plugs Directly into the flange mount. DS-MPB: Similar to above but in black. 1688: Charging your device just got even easier. Featuring two USB ports & 2.1amp output to provide enough output for charging any modern device including iPads. 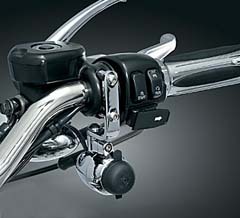 Mount anywhere you choose including inside your tour pack, on the dash, or on your handlebars. 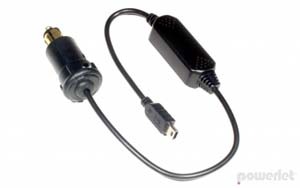 BB-309: This Dual USB Auxiliary Cigarette Element is designed to plug into a 12 volt cigarette lighter socket and allow charging of electronic devices via USB connections. 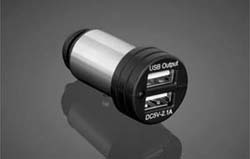 This Auxiliary Cigarette Element has 2- USB plugs, providing a 2.1 Amps power supply with an LED indicator when properly connected. 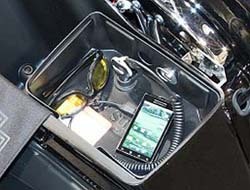 Compatible with iPods, iPhones, MP3, GPS, and other devices. Even has magnetic metal body to help it stay in place while riding. 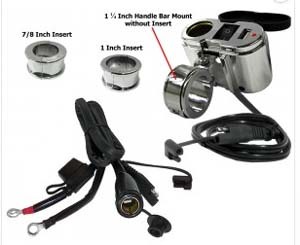 LG-6: Cigarette Lighter Adapter for many H-D models. Simply plugs into the wiring harness under the seat. Can power GPS devices, phone chargers, radar detectors, ect. email us for bike fitment criteria. 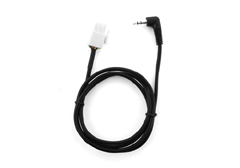 LG-41: Cable (For Goldwing F6B). 3.5mm Audio Cable for iPhone or iPod. 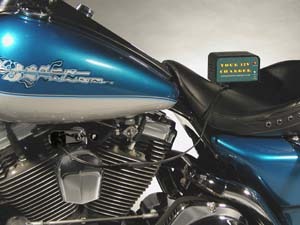 This cable plugs into existing harness under left fairing pocket and allows you to connect your iPod, iPhone, or other device with a 3.5 mm port to the Goldwing's audio system. Round 3.5 mm plug to flat 3 pin Goldwing plug. Plug-in installation. 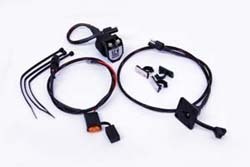 Fits these models:2001-2014 Goldwing GL1800, 2013-2014 Goldwing F6B. All Goldwing 1800's from 2001-2010.